This is what I've found to be the essentials to take on just about every ride. 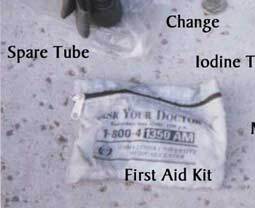 The Iodine tabs may seem a bit survivalist but who knows, they're lightweight! 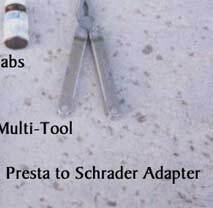 The Presta to Schraeder adapter is great for those times whn a filling station is nearby and you don't feel like pumping 200 rounds on micropump. the Multi-tool comes in handy when you least expect it. Bent BOB trailer cotterpin holes come to mind. I get a kick out of changing a flat that may have crept up at work from a slow leak and in ten minutes be ready to ride. Try changing a car tire by hand! 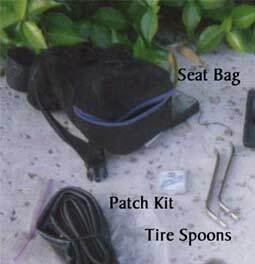 If you buy a prepackaged tool kit it will generally have all the tools necessary to make minor repairs on the road. Any true technogeek will notice I have lost the tool which has the spoke wrenches on it. 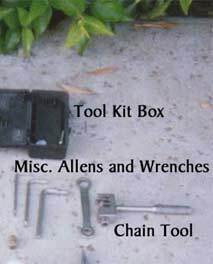 I also pack a Parke Alien tool (thanks Chris& Jay) on some trips but find the good old tool box a bit more handy. Bike Anatomy part 3 will be my commuter pack guts!